Why Choose This Specialized Regulator? The CASS Suction Regulator not only provides precision low-level suction, but also affords the caregiver the ability to apply a momentary suction pulse to clear occlusions in the CASS lumen. It provides the unique ability to clear occluded lines without utilizing a syringe or breaking the patient connection. The CASS Suction Regulator provides the ability to clear the occlusions without affecting the initial suction setting. That means less exposure to potentially contaminated fluids and the ease and assurance of suction line patency. Infection control committees have enthusiastically welcomed our regulators, which are capable of being disinfected by gas, autoclave, Cidex, pasteurization or Sterrad™. With fewer parts, reliability increases and cost of operation decreases. Its rugged design virtually eliminates the need for calibration and repair. Our regulators are extremely tolerant of flooding and can be flushed should this occur. We didn't feel we needed more evidence. We have been extremely happy with the performance of these regulators in our hospital. The clinical effort to reduce rates of ventilator-associated pneumonia (VAP) include removal of subglottic secretions. 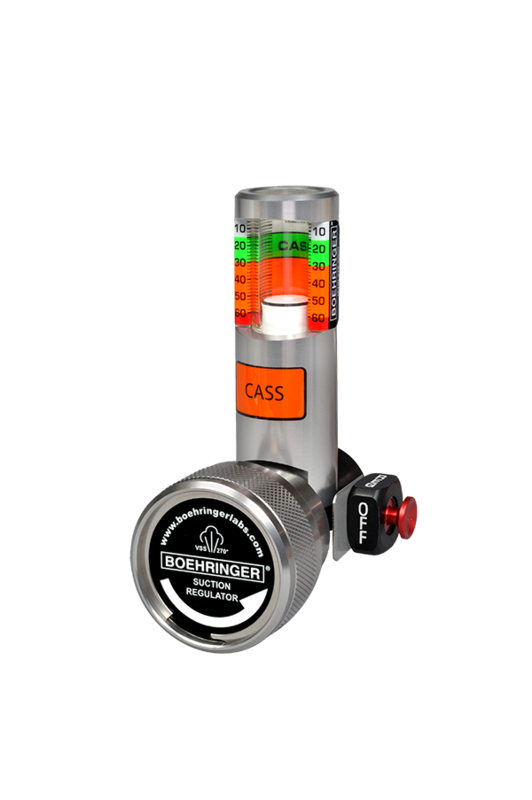 Boehringer Laboratories, LLC proudly introduces the only suction regulator specifically designed to aid in the safe and efficient application of CASS. Recent clinical studies conducted by DEBORAH Heart and Lung Center, Browns Mills, New Jersey, have shown the effectiveness of the use of the CASS Suction Regulator with CASS protocol to reduce incidence of Ventilator-Associated Pneumonia. The studies, initiated by John Hill, Co-Technical Director of Respiratory Care, have received national attention from the AARC and The American College of Chest Physicians. Click Here to view abstract. This product was developed in response to the most commonly experienced challenge of CASS; tenacious secretion removal, or clogging of the suction lumen. The Power Pulse technology clears blockages while improving patient safety by isolating the delicate mucosal tissue from high suction. The low levels of suction needed for CASS can leave lines prone to clogging during periods of patient intubation. Routine interventions that require opening the suction circuit not only create a vector for pathogens but also create additional disposable medical waste and potentially expose caregivers to pathogens.The safety and accuracy of Boehringer CASS Regulator makes it a preferred product to utilize when performing CASS. We guarantee the CASS Suction Regulator parts and labor for 10-years. We will replace free of charge any part that fails on our CASS Series Suction Regulator for 10-years from the date of purchase.